Well, it had to happen. Now the real question is to see what Microsoft does about it. I don't think the full lock down treatment a'la Apple was ever really intended, but neither is the free-for-all that is Android. Some happy third way? I don't know about you, but I'd veer toward allowing a modicum of freedom - if you're going to go out of your way to root your device, then you'll know (and should be willing to bear) the consequences. 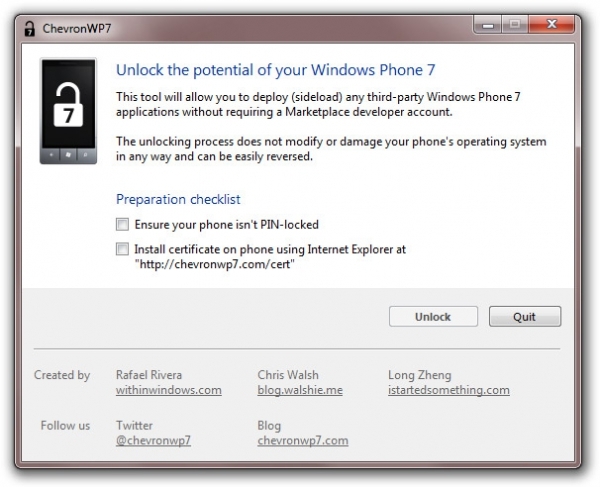 I saw this on another site, windows phone central, and I am surprised how fast the unlocking came, and it does seem pretty painless. My hope is the site freeware pocket pc .net develops its Cydia-like store. As a Windows Mobile user, I like using their store app, O-Market, and I find some of the coolest and useful free apps out there. I do try to donate money wherever possible. This is an exciting first step, and I think this was def needed. I am impressed that this was done. This makes me want to get a windows phone 7 device. I would like to see a dev of the app store, and see the evolution of both the OS and the community. I think if the community get a lot of press on how great WP7 platform is, I think this would only help MSFT in the long run. If you notice that Apple built a great product and i think part of the reason why sales are through the roof is the support of its community (both the app devs and the hackers). WP7 i notice has a bigger community outside the USA but I am still a strong supporter of their mobile OS. I had a choice of iPhone but I chose to go with Windows Mobile and glad I did. Microsoft's response, as reported elsewhere (pocketnow.com for one) was rather mild. Sort of "gee we wish people wouldn't do that because it could void the warranty and do other bad stuff too." Sounds like the right approach. I certainly admire the work that the gang at xda and other places can do but as much as I've been tempted I've never installed one of their ROMs or any of their apps on a Windows Mobile device. I was tempted because there was real innovation happening there and nothing that similarly caught my attention in the offical Windows Mobile marketplace. The unofficial channels will have to work harder to compete with the WP marketplace. A ringtone app isn't enough.